Pirates are overrunning the city and it is your job to stop them. 7 Cities by Neptune Entertainment is a fun and unique tower defense game. 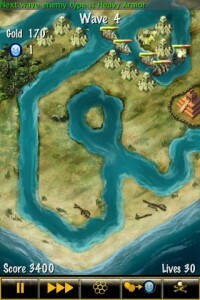 There are three modes of game play: New Campaign Map. New Survival Map, and Open Waters. The goal in the Campaign Mode is to see if you can survive the attack waves and save the seven cities. Survival Map is very similar to the Campaign Mode, but the waves of pirates don’t stop coming. You have thirty lives in both modes. Open waters is a fun mode because there is no set path for the ships. You place the towers wherever you would like them, and the pirates try to find the quickest way to the city. All of the basic rules still apply. There are three difficulties levels in the game. The harder the difficulty, the less gems and gold you begin with. The towers available include: Arrows, Cannons, Tornadoes, Lightning, and Obelisk. These towers must be unlocked by completing stages. 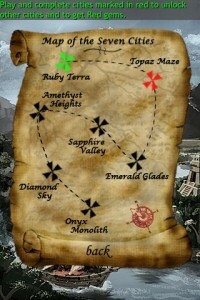 To place a tower, select any point on the map, select your tower type, and then click to build. This game is unique because the towers gain experience points to gain additional powers. The gold is used to buy towers, and the gems are used to upgrade them. There are five buttons at the bottom of the screen. The first is a pause button. The second, one of my favorite features, is a fast forward button. This button gives you the option to multiply the speed of the game by two or three times. The next is a grid toggle. This button gives you the option to see, or not to see, where towers can be placed. The next is a button that gives you the option to trade in one hundred gold for a blue gem. The final button, the menu button, lets you restart game, quit game, exit to the main menu, and save and quit. Once you have completed a level, or failed, your score is placed on the high score board with the option to submit it on the online server. The options menu lets you change sound and music levels, turn tool tips off, and reset profile. The skill unlocker is where you go to unlock new abilities and powers. Each power and ability costs one red gem. Once you have chosen which power you would like, hit confirm and you will be able to use that power in the game. The archives let you view your high scores, and watch the credits. 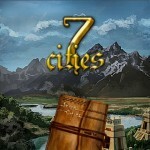 7 Cities is a great tower defense game with several features, which make the game more enjoyable. It is a great way to pass the time and fun for all the boring meetings in your life.